Nobody’s pretending that any garden is at its best in winter, but in one of this size there’s always something to enjoy as long as you don’t expect the grooming to be perfect! We try to finish our winter projects by the end of the month in readiness for the beginning of the ‘gardening season’, but there are invariably jobs that go on too long, or storms that come at inappropriate times, or dare I say it, days when I wake up and think ‘Let’s do this today’, even if it hadn’t been planned. Sometime it’s the only way to get them done and then it’s an ‘all hands on deck’ day! We ask visitors to stay off the lawns and we close off some of the most sensitive soft paths, but otherwise the garden is open for business every day. We make sure that the paths are clear after storms, that drains are not blocked and overflowing and that no damage can be done to either the garden or to our visitors! Inevitably there will be work in progress, tree surgery going on, or areas temporarily out or bounds, but that’s all part of being open every day of the year. The only time we close is when the wind is strong enough to fill the air with flying debris or even to blow trees down and then we close for public safety! On the plus side, however, even in February there are plants in flower. Taking 2015 as an example, we have camellias blooming, a number of rhododendrons out including several of the large Rh protistum and a promise of more species to come shortly, mahonias, snowdrops, snowflakes, crocuses and even Purple Toothwort, for some reason! You may spot, or smell, a few less than obvious flowers – Lonicera fragrantissima, for example, or various Sarcococca species whose flowers are fairly inconspicuous but powerfully fragrant! And on chilly days when the showers come fast and frequent, a walk to the high viewpoint can be rewarded with a clear blue sky and a prospect of the snow-covered mountains of Mull across the dark blue sea! Is February the beginning of spring? There are certainly signs that the worst of the winter may be passing as the days begin to lengthen and the light levels increase. There is even sunshine on a few days. But the debris from winter gales is everywhere, trashed leaves and twigs blown in deep piles and larger branches, especially of lime and birch trees. The blackbirds have been pulling at the mossy path edges in search of grubs so more to be tidied up. Fallen trees have been for the most part cleared or await the tree surgeon and the crane for removal; the log piles grow ever higher. 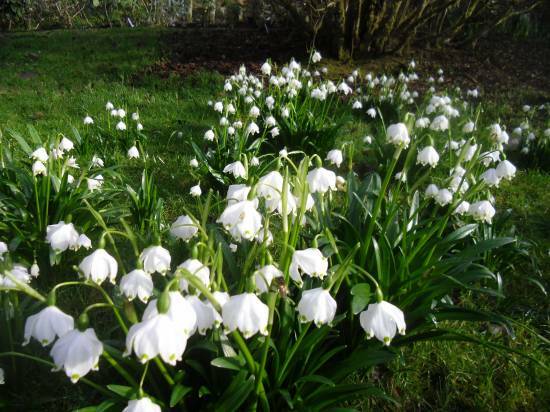 Regardless of the wintery weather, by early February the snowdrops are showing well and there are early snowflakes, soon to erupt as huge clumps in some areas. These can certainly stand everything that we may still endure, snow, hail, rain and frost. The first daffodils are also in bud and by the middle of the month will be flowering although the whole narcissus family take at least 3 months to complete their wonderful early display. There are buds visible on N minor by mid-February, one of the smallest of the species, and they will usually be out in flower by the end of the month. 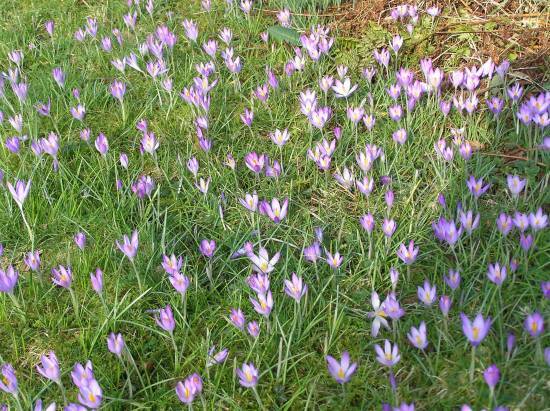 The thin spikes of Crocus tommasinianus start to appear, hardly noticeable until suddenly on a sunny day you can see hundreds of tiny crocus, all shades of mauve, white and purple. In our garden, the air is scented by hamamelis although all our plants now are relatively small recent additions as the old originals do not last forever. There are also early daphnes, tiny white D blagayana on a raised bed and D bholua ‘Peter Smithers’. Sarcococca is almost as powerful in perfume but the flower is insignificant on this evergreen bush. Everywhere hellebores are opening their buds with nodding or side-facing flowers in shades of cream and pink to the deepest purple and slatey black. These look great against Daphne bholua. The first rhododendrons are showing colour in bud – R moupinense and its hybrids always early to flower and R dauricum ‘Mid Winter’ and R mucronulatum with their first precocious mauve flowers visible on bare branches. 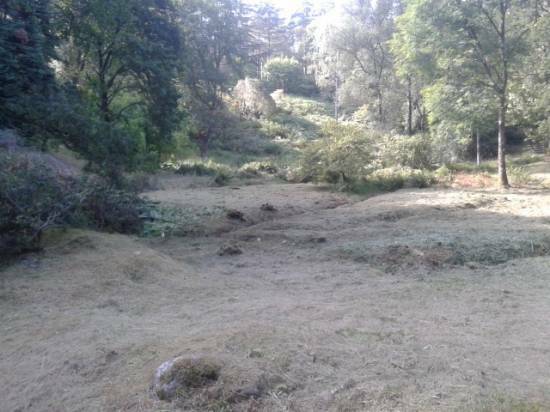 It’s the time of year for completing tree work, dead wooding, trimming and tidying and dealing with enormous stumps from earlier tree removals, while trying to avoid the narcissus sprouting underfoot. Bonfires can last for days as sticks are brought in from around the garden. But its an expectant time and each new flower brings promise of spring. February can be a lovely month in the garden, with all the expectation of spring, but the peacefulness of winter dormancy. The snowdrops have been out for a few weeks and the new bulbs planted in the autumn, in places you think you’ll never forget, surprise you. Hellebores are a treat as there are such a range of colours, from white and pink to maroon and even creamy yellows. 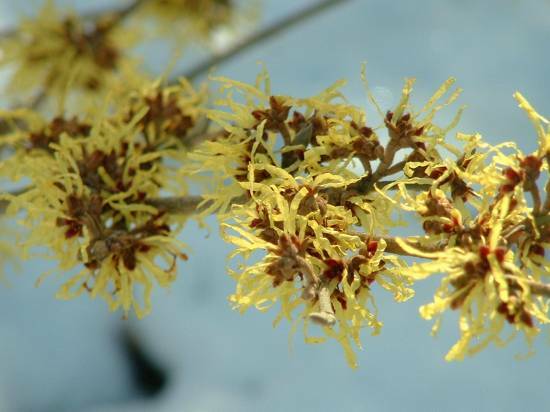 The witchhazels flower very early with hamamelis mollis standing out the most, but hamamelis intermedia Diane, with its red flowers, so subtle and unusual. Pieris are a common acid loving shrub in many gardens, but there are so many varieties with abundant sprays of bell-like flowers in cream and all shades of pink flowering in February and which later have such lovely young pink leaves. Rhododendron nobleanum venustum flowers continuously from December to April, with frost touching some flowers if fully open, but more buds always waiting. Camelia buds are bursting with potential – how much bloom will you get this year without frost damage? In the polytunnels the fan trained peaches blossom towards the end of February with white flowers on the yellow peach and pink flowers on the purple peach. The sunniest days are usually the coldest, but the birds know spring is coming and all feels positive – until the grey clouds and cold rain blow in and remind you it’s still winter!